I have received much love from my blogging friends this past week or so and I want to share the love! This seriously could not come at a better time either...job hunting does a number on your self-esteem ya know?! from Elizabeth @ Scandalous Women I received a BEAUTIFUL & an INFORMATIVE from Lizzy J @ Historically Obsessed ! Thank you ladies! 2. I have always wished that I was around to experience the 70's. Woodstock, hippies, Haight Ashbury, peace, love and all of the groovy tunes - I should have been there! From Heather @ The Maiden's Court...thank you my dear, you are so sweet! Enjoy the award. If you don't want to put it on your blog, don't. Just get the warm, fuzzy feeling that I'm sending your way! You don't have to reveal any deep, dark secrets about yourself or answer any sort of questions. You've already earned it! You don't have to link back to me. You don't have to give it to anyone else." 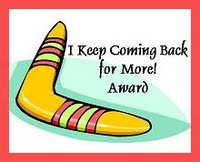 From Allie @ Hist-Fic Chick...this award is just so cute and kookie...just like me =) Ok, maybe just the kookie part! Thanks Allie - I love it!! 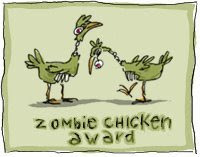 "The blogger who receives this award believes in the Tao of the zombie chicken - excellence, grace and persistence in all situations, even in the midst of a zombie apocalypse. These amazing bloggers regularly produce content so remarkable that their readers would brave a raving pack of zombie chickens just to be able to read their inspiring words. As a recipient of this world-renowned award, you now have the task of passing it on to at least 5 other worthy bloggers. Do not risk the wrath of the zombie chickens by choosing unwisely or not choosing at all." I recently read THE best book review of any book I've ever read. 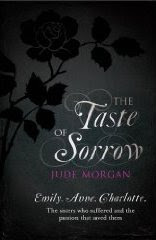 Sarah Johnson from Reading the Past (and also author of Historical Fiction I & II: A Guide to the Genre) reviewed Jude Morgan's The Taste of Sorrow, which is a novel of the Bronte sisters. This review seriously knocked my socks off, while simultaneously killing any faith I had in my own reviewing skills. But I digress. I've included the synopsis below from Amazon, but it doesn't quite do it justice - Sarah's review is what you need to read to catch the essence of the novel. From an obscure country parsonage came the most extraordinary family of the nineteenth century. Through the bleakest beauty and most appalling suffering, the Bronte sisters created two of the most brilliant and disturbing novels ever written: Jane Eyre and Wuthering Heights. In this astonishingly daring and moving novel, acclaimed author Jude Morgan recreates the story of this strange explosion of genius and uncovers the fascinating lives of this unique family. Yoo Hoo...hey all you Historical Fiction Fanatics! 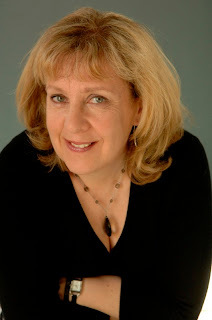 The incomparable Elizabeth Chadwick is going blog-hoppin' for the US release of The Greatest Knight (my favorite read of 2009) and you are invited! Here is a listing of where EC will be and when. These are some really fantastic blogs, so please check them out! If this one book proves to be as tantalizing as the synopsis makes it sound, we are in for a good ride! SYNOPSIS: An astonishing novel that removes Emily Dickinson’s own mysterious mask and reveals the passions and heartbreak of America’s greatest poet. What if the old maid of Amherst wasn’t an old maid at all? 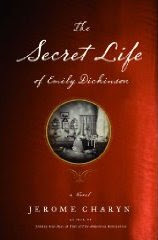 Her older brother, Austin, spoke of Emily as his “wild sister.” Jerome Charyn, continuing his exploration of American history through fiction, has written a startling novel about Emily Dickinson in her own voice, with all its characteristic modulations that he learned from her letters and poems. The poet dons a hundred veils, alternately playing wounded lover, penitent, and female devil. We meet the significant characters of her life, including her tempestuous sister-in-law, Susan Gilbert; her brooding father, Edward; and the Reverend Charles Wadsworth, who may have inspired some of her greatest letters and poems. Charyn has also invented characters, including an impoverished fellow student at Mount Holyoke Female Seminary, who will betray her; and a handyman named Tom, who will obsess Emily throughout her life. Charyn has written an extraordinary adventure that will disturb and delight. The year is 1588. The Spanish Armada is threatening Elizabeth’s Protestant England, the Duc de Guise is harassing the cross-dressing, Metrosexual French King, Henri and Henri’s mother, Catherine de Medici, is still on the hunt for the Silver Rose. The aging Catherine is not growing old gracefully and is desperate to find the Silver Rose. Louis Xavier, a necromancer, is Catherine’s last hope and she hires him to go to Faire Isle and to abduct the Silver Rose. Unfortunately for Catherine, she has been played false and Xavier is actually a pirate with no intention of going to Faire Isle. But fate has another plan in mind. The Silver Rose, now called Meg, is safe among the Daughters of the Earth on Faire Isle. Ariane, the oldest of the Cheney sisters, heads up this coven of healing women and is busy preparing for the naming of her successor when a stranger (Xavier) washes ashore of Faire Isle. She is quite shocked, to say the least, when it is revealed who this stranger truly is. Jane Danvers, has been persecuted and exiled for her religious beliefs by Queen Elizabeth and is now living on Faire Isle. Jane feels a strange connection with this stranger from the beginning and offers to care for him while he recuperates. They eventually fall in love. However, the “and they lived happily ever after” part is going to have to wait – Xavier’s rouse has been found out by Catherine and she is one ticked off lady. Now he must do whatever possible to save himself, the Silver Rose and the other women on Faire Isle from The Dark Queen. Twilight of a Queen is the fifth book in Susan Carroll’s Dark Queen series. While it is not a required to have read the other four before this one, you would really miss out on some good reading and I am ever the neurotic one when it comes to reading a series in order. I do have to say that I was a bit under-whelmed by this one. 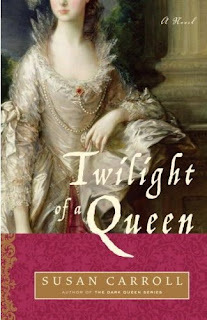 I found the other four books in the series more entertaining …Twilight of a Queen was more a love story, which is fine, but I wanted more Catherine and more drama! Thanks to the talented, beautiful and oh-so-generous Michelle Moran, I am able to bring to all of you one of the best giveaways of the year...1 AUTOGRAPHED COPY OF CLEOPATRA'S DAUGHTER!!! The marriage of Marc Antony and Cleopatra is one of the greatest love stories of all time, a tale of unbridled passion with earth-shaking political consequences. Feared and hunted by the powers in Rome, the lovers choose to die by their own hands as the triumphant armies of Antony’s revengeful rival, Octavian, sweep into Egypt. Their three orphaned children are taken in chains to Rome; only two– the ten-year-old twins Selene and Alexander–survive the journey. Delivered to the household of Octavian’s sister, the siblings cling to each other and to the hope that they will return one day to their rightful place on the throne of Egypt. As they come of age, they are buffeted by the personal ambitions of Octavian’s family and court, by the ever-present threat of slave rebellion, and by the longings and desires deep within their own hearts. 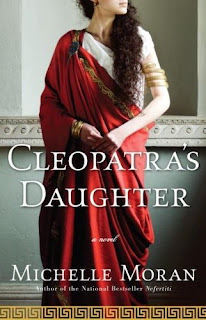 The fateful tale of Selene and Alexander is brought brilliantly to life in Cleopatra’s Daughter. Recounted in Selene’s youthful and engaging voice, it introduces a compelling cast of historical characters: Octavia, the emperor Octavian’s kind and compassionate sister, abandoned by Marc Antony for Cleopatra; Livia, Octavian's bitter and jealous wife; Marcellus, Octavian’s handsome, flirtatious nephew and heir apparent; Tiberius, Livia’s sardonic son and Marcellus’s great rival for power; and Juba, Octavian’s watchful aide, whose honored position at court has far-reaching effects on the lives of the young Egyptian royals. Selene’s narrative is animated by the concerns of a young girl in any time and place–the possibility of finding love, the pull of friendship and family, and the pursuit of her unique interests and talents. While coping with the loss of both her family and her ancestral kingdom, Selene must find a path around the dangers of a foreign land. Her accounts of life in Rome are filled with historical details that vividly capture both the glories and horrors of the times. She dines with the empire’s most illustrious poets and politicians, witnesses the creation of the Pantheon, and navigates the colorful, crowded marketplaces of the city where Roman-style justice is meted out with merciless authority. Based on meticulous research, Cleopatra’s Daughter is a fascinating portrait of imperial Rome and of the people and events of this glorious and most tumultuous period in human history. Emerging from the shadows of the past, Selene, a young woman of irresistible charm and preternatural intelligence, will capture your heart. * Giveaway ends on September 14th. Winner will be announced on September 15th. * Open to all domestic and international entries. Happy Sunday my sunshines! I hope this day is treating you well! It's starting out to be a beautiful day here in Georgia - a hint of Autumn in the air, which I am totally diggin'! If only it would stay! Well, I finished Elizabeth Chadwick's The Greatest Knight this weekend and I can safely say it will be my Top Read of 2009. This is one seriously awesome historical fiction novel! Jamie Fraser from the Outlander series finally has some competition in William Marshal - what a hunk! Reminder: My giveaway for a copy of The Greatest Knight ends on August 30th! Click here to enter! I am now onto Jeane Westin's The Virgin's Daughters. I admit to having some reservations about yet ANOTHER novel on Elizabeth I (even though she is my favorite monarch), but so far, so good and I'm enjoying Westin's style of writing. This past week there has been lots of blog love thrown my way and I am thrilled and a little overwhelmed at it all! When I started this blog, I had NO IDEA it would go this far or even that I would stick with it this long! Now I can't imagine NOT having this blog. Passages to the Past has been nominated for 5 BBAW 2009 awards: Best History/Historical Fiction Blog, Most Prolific, Best Writing, Most Humorous/Funniest and Most Extravagant Giveaways. I have turned in my submissions to the judging panel and we should all find out who made the shortlist on September 7th and then let the voting begin! Good luck to all nominees...there are so many awesome bloggers that were nominated and I'm so honored to be among them! The fabulous Lizzy J from Historically Obsessed - one of my fav HF blogs - has created her own award and yours truly is among the HF bloggers she has lovingly bestowed it upon! Isn't is so pretty? Thank you so much Lizzy - you are such a sweetheart! 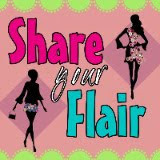 Please stop by her blog if you've yet to - it's as fantastic as she is! Here is what she says: Amy from Passages to the Past - Her lovely obsession of HF novels. If anything happens with a novel or upcoming novel, Amy knew the day it happened, which she kindly shares with us all. At a time when a woman’s value was measured solely by her wealth and the number of sons she bore, Eleanor was the high-spirited, stubborn, and intelligent heiress to the vast Duchy of Aquitaine. Her leadership inspired the loyalty of her people and yet, despite having the inheritance of a duchy and the bearing of a queen, she was continually doubted and silenced by the men who ruled beside her—the less wise, but far more powerful men of the church and French court who were unwilling to lose power to a woman, regardless of rank or ability. Through two marriages to French kings, two Crusades and, the birth of nine children—including the future King Richard the Lionhearted—Eleanor of Aquitaine solidified her place in history. 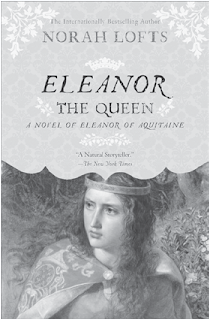 In Eleanor the Queen, Norah Lofts brings to life a brave and complex woman, centuries ahead of her time. Reunited after a hard-fought but tenuous victory, the young former High Queen Isolde and her friendand protector Trystan are sent on a dangerous quest to keep Lord Marche from usurping the throne of Britain through the brute force of his Saxon allies. This time, they must act as diplomats, persuading the rulers of each of the smaller kingdoms, from Ireland to Cornwall, that their loyalty to King Madoc is needed to keep Britain from the hands of a despot. 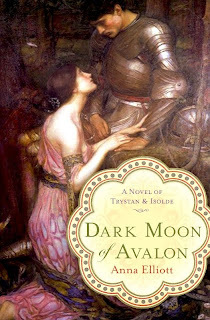 With the combined influences of Isolde’s cunning wit and talent for healing, and Trystan’s strength and bravery, they must win the loyalty of a kingdom to fight for the side of right. Though Trystan has protected his identity for years, he has been exposed to the one person he’s feared the most—his father, Lord Marche, who now understands the threat his estranged son will prove to be. With admissions of love hanging in the air, both Trystan and Isolde feel that their presence puts the other at greater risk. But when their situation is at its most desperate, they must finally confront their true feelings towards each other, in time for a battle that will test the strength of their will and their hearts. Psychiatrist Andrew Marlowe, devoted to his profession and the painting hobby he loves, has a solitary but ordered life. When renowned painter Robert Oliver attacks a canvas in the National Gallery of Art and becomes his patient, Marlowe finds that order destroyed. Desperate to understand the secret that torments the genius, he embarks on a journey that leads him into the lives of the women closest to Oliver and a tragedy at the heart of French Impressionism. Kostova’s masterful new novel travels from American cities to the coast of Normandy, from the late 19th century to the late 20th, from young love to last love. 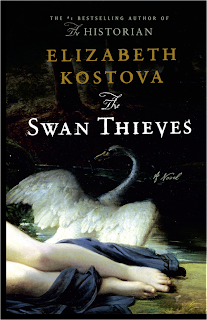 THE SWAN THIEVES is a story of obsession, history’s losses, and the power of art to preserve human hope. BBAW 2009: Passages to the Past has been nominated! I received some really exciting news today...Passages to the Past has been nominated for three BBAW 2009 Awards! Thank you, thank you whoever nominated me....I am so honored! And from what I hear, I am in excellent company! Good luck to all nominees! For more information on the BBAW 2009, click here! Thanks to Amy from My Friend Amy for founding the BBAWs and for all of her hard work and dedication to the book blogging community! Head on over to Susan Higginbotham's Blog to check out the cover art for her upcoming novel on Henry Stafford, Duke of Buckingham, and Katherine Woodville, The Stolen Crown. I don't know about you, but I LOVE it! Isn't it gorgeous!? Early in 1815, Louisa Catherine Adams and her young son left St. Petersburg in a heavy Russian carriage and set out on a difficult journey to meet her husband, John Quincy Adams, in Paris. She traveled through the snows of Eastern Europe, down the Baltic coast to Prussia, across the battlefields of Germany, and into a France then experiencing the tumultuous events of Napoleon’s return from Elba. Along the way, she learned what the long years of Napoleon’s wars had done to Europe, what her old friends in the royal court in Berlin had experienced during the French occupation, how it felt to have her life threatened by reckless soldiers, and how to manage fear. The journey was a metaphor for a life spent crossing borders: born in London in 1775, she had grown up partly in France, and in 1797 had married into the most famous of American political dynasties and become the daughter-in-law of John and Abigail Adams. The prizewinning historian Michael O’Brien reconstructs for the first time Louisa Adams’s extraordinary passage. 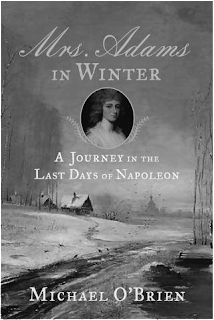 An evocative history of the experience of travel in the days of carriages and kings, Mrs. Adams in Winter offers a moving portrait of a lady, her difficult marriage, and her conflicted sense of what it meant to be a woman caught between worlds. I am so excited to announce PTTP's newest giveaway: The Greatest Knight by the fantabulous Elizabeth Chadwick! Royal protector. Loyal servant. Forgotten hero. A penniless young knight with few prospects, William Marshal is plucked from obscurity when he saves the life of Henry II's formidable queen, Eleanor of Aquitaine. In gratitude, she appoints him tutor to the heir to the throne, the volatile and fickle Prince Henry. But being a royal favorite brings its share of danger and jealousy as well as fame and reward. A writer of uncommon historical integrity and accuracy, Elizabeth Chadwick resurrects the true story of one of England's greatest forgotten heroes in a captivating blend of fact and fiction. The Greatest Knight restores William Marshal to his rightful place at the pinnacle of the Middle Ages, reflecting through him the triumphs, scandals, and power struggles that haven't changed in eight hundred years. * Giveaway ends on August 31st. Winner will be announced on September 1st. A HUGE thank you to Danielle and Sourcebooks for bringing us this giveaway! 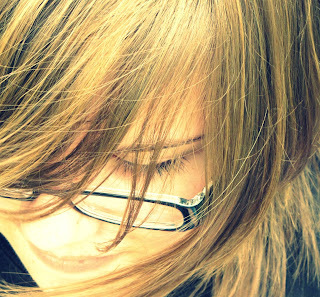 My daughter, Danielle a.k.a. "Bella"
Susan Higginbotham reveals cover for new novel!